Meet us after work on the first Thursday evening of every month for a new kind of happy hour in Westchester! 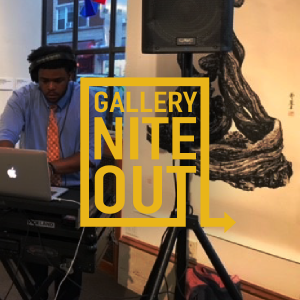 Anchored by ArtsWestchester’s contemporary art exhibitions, Gallery Nite Out at ArtsWestchester is a series of creative interactive events hosted in ArtsWestchester’s downtown White Plains gallery. Enjoy an evening with people who love the arts as much as you do! Special highlights throughout the series include live DJs, specialty tastings by local restaurants and more. All events will include: Amazing contemporary art, Wine, beer and light bites, Art activities inspired by ArtsWestchester’s current exhibition, A unique art gallery setting (check out the bank vault!). Ticket includes entrance to the event and exhibition, activity, tastings and 2 drink tickets for the bar. December is the most wonderful time of the year to party for the arts! Meet us in ArtsWestchester’s gallery to start the holiday season off right! Join in on the merry-making as you enjoy light bites and cocktails and dance the night away to live music by DJ CLAFFMATIC. Enjoy a DIY holiday gift-making table as well! Activities TBA. First come, first serve while supplies last.